Michelle Hunt-Harris holds a sign showing the gang lines students would have to cross should CPS close schools in Austin. Inside the backpacks of Lattrice Jamison’s children on Thursday were several sheets of paper, some of which infuriated her and others that confused her. On top of this news, their folders contained an application and a two-page list of all the schools to which she could apply. This led Jamison to conclude that her children, now in 5th and 6th grade, and their classmates would be not be guaranteed a seat anywhere. She said principals would be allowed to pick and choose which students they wanted to take in and the decision would be based on test scores. “Why should I have to apply?” said Jamison, who serves on Emmet’s local school council. A day after CPS announced plans for the largest school shakeup in history, parents were trying to figure out where their children would attend school next year, as many vowed to fight the actions. CEO Barbara Byrd-Bennett is recommending that 53 elementary schools and one small high school close. The Board of Education is set to vote on the measures at its May 22 meeting. In actuality, Jamison doesn’t have to apply unless she wants to enroll her children somewhere other than the designated receiving schools, said CPS spokeswoman Robyn Ziegler. Ziegler said the application was handed out because CPS extended the deadline for open enrollment and magnet cluster schools, in an effort to give parents choice. However, sought-after spaces in high-performing magnet, selective enrollment and most charter schools are already filled. The situation was made more difficult by the complicated scenarios designed by CPS officials as they attempted to get all displaced students into what they consider to be better facilities and better school programs. Students at 16 of the schools that are closing will stay in the same building, which will be taken over by the principal, staff and students of higher-achieving schools. In five separate situations, students will be assigned to one of two or three schools. CPS did not say how it will assign students when there’s more than one welcoming school. In addition, 18 of the schools have special education cluster programs, which serve more severely disabled students from the area. These students might not go to the designated welcoming school, but rather be assigned to different places. As parents and activists digested this information, they continued to return to what has been a common concern as the announcement of mass school closings approached. Jamison joined a group of West Side activists at a press conference where speakers accused district leaders of targeting black students and putting them in danger. Jamison said that students from DePriest and Ellington already get into fights with those from Emmet. “They come to the school and jump over fences and fight,” she said. 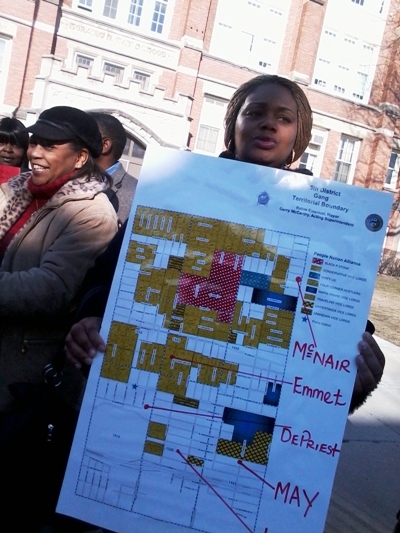 Michelle Hunt-Harris held a poster that showed the gang boundaries in Austin and where the schools that were recommended from closure are located in relation to their welcoming school. Hunt-Harris, who serves on the local school council at May, said she is in a “state of unease” as she worries about the children crossing gang boundaries. “Our community is being disrespected,” she said.